For courses in the fundamentals of photography. A Short Course in Photography: Film and Darkroom, 10th Edition introduces readers to the fundamentals of photography including black-and-white, color, and digital. Topics covered include equipment, accessories, the exposure and development of film, and the making and finishing of prints. The authors also offer advice on how to select the shutter speed, point of view, or other elements that can make the difference between an ordinary snapshot and an exciting photograph. All aspects of photography are clearly explained, with every pair of pages covering a complete topic, along with accompanying illustrations, diagrams, and photos. In addition to learning the basics of photography, readers will also be exposed to photographs by great photographers and artists, including Deborah Willis, Roe Ethridge, and Gordon Parks. The 10th Edition includes new artistic examples by contemporary artists, technological updates, and discussion of the latest digital applications. Jim Stone is an Associate Professor of Photography at the University of New Mexico. His photographs have been collected by the Museum of Modern Art and The Smithsonian American Art Museum, among many others. Books of his work include Stranger Than Fiction (Light Work, 1993), Historiostomy (Piltdown Press, 2001), and Why My Pictures are Good (Nazraeli Press, 2005). He has also published six higher education titles that are widely used in university courses: A User’s Guide to the View Camera, Darkroom Dynamics, Photography, Photography: The Essential Way, A Short Course in Photography, and A Short Course in Digital Photography. 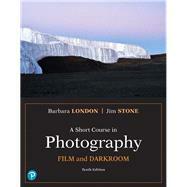 Barbara London has authored and co-authored many photography books from their first editions to their current ones, including Photography, Photography: The Essential Way, A Short Course in Photography, A Short Course in Digital Photography, The Photograph Collector’s Guide, and more.